Pop-punk hasn’t had the greatest 2017, probably because no one knows where it’s at at the minute. A couple of years ago the scene’s top players were the harder-edged bros bringing some aggro kick back to the genre alongside the older standards, but since then, most have either drastically softened their sound or just made the jump to pop entirely. As of now pop-punk doesn’t really know what it wants to be, leaving the cluster of bands who’ve managed to survive the fallout to forge their own paths and design a new path for themselves. But be honest, did anyone really expect one of those bands to not only survive, but prosper, would be Seaway? Colour Blind might have been a decent all-rounder as far as classic pop-punk went, but it didn’t really suggest that the Canadians would step out of the shadow of many a bigger act to create noise for themselves. Well, apparently that was the wrong assumption to make, especially since Vacation goes way above and beyond to potentially be the best pop-punk album released this year. It really is a pleasant surprise to see how Seaway have grown and applied themselves in the two years since Colour Blind, and coming back with an album as exuberant, comprehensive and just plain fun as this means they fully deserve every bit of praise they get. What’s perhaps the most important thing in keeping Seaway up on Vacation is how they’ve progressed their sound, and like Neck Deep did on The Peace And The Panic, there’s a fair bit taken from outside pop-punk but applied in such a way to still seem familiar. With Vacation, the peripheral presence of Weezer and Third Eye Blind can definitely be felt, and the crunchier, chunkier power-pop on the likes of London and Misery In You that meshes into a genuine defining presence, even before the pieces of emo and pop-rock are thrown in for good measure. That’s not to say there isn’t polish there – the sleek, processed beats of Lula On The Beach can still be attributed to Weezer but the complete wrong era – but it’s never overbearing. Ryan Locke’s harsher, more hoarse vocals inject even more grit to the almost-screams of Car Seat Magazine and 40 Over, and even if only getting Beartooth’s Caleb Shomo to sing on Scatter My Ashes Across The Coast, Or Don’t and not even have him let out some visceral fire seems like a bit of waste, it’s clear that Seaway are looking out far beyond their own genre for inspiration, and actually doing it rather well. It’s also indicative of Vacation not being all smiles as its title and artwork would suggest. 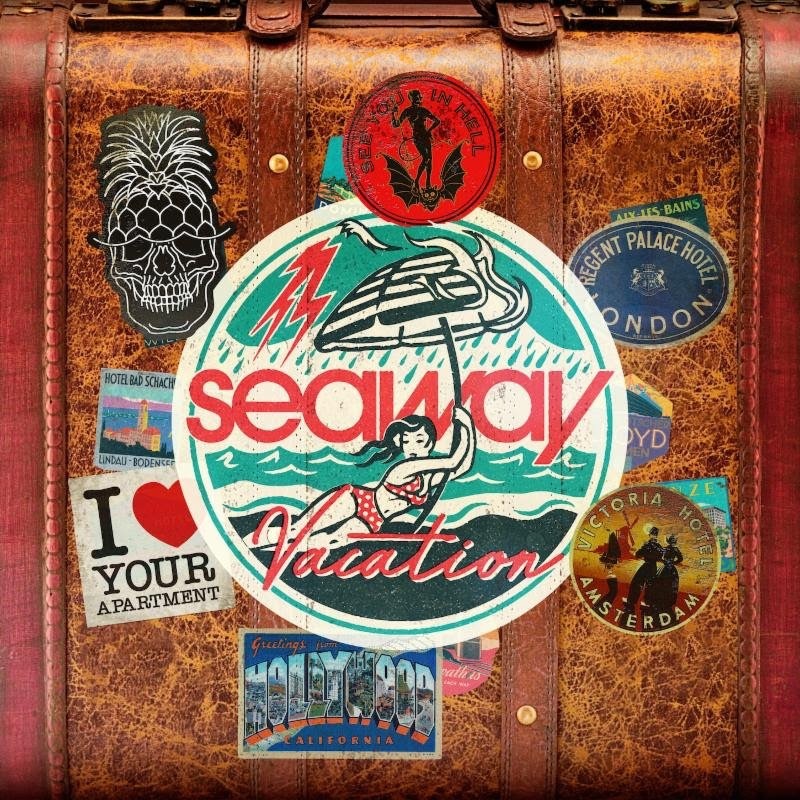 Rather, the word in this case is used to describe Seaway returning home – a vacation from touring, as it were – and the dichotomy between home life and being on the road. This has the capacity to collapse in on itself in spectacular fashion, even as early as the second track when Neurotic gets perilously close to “I hate my hometown” pop-punk clichés. But Seaway are clearly smarter than that, acknowledging that returning home means not having to miss friends or birthdays that are neglected from touring. That’s only a condensed look at Seaway’s three-dimensional look at such at topic, and they go into enough detail to make for a satisfying exploration. There are the lovestruck Friends and Saved By The Bell references on Something Wonderful and just spending time doing nothing with that special someone on Apartment, but Seaway are quick to turn back on themselves. The focus then shifts on old flames leaving home, either to find fame on Day Player or just for a change of scenery on London, before dealing with personal problems that are brought back up to the conscious on Scatter My Ashes Across The Coast, Or Don’t and the inevitable breakdown of a relationship strained by distance on When I Hang Up. It’s not new ground whatsoever, but there’s at least an attempt to give it a fresh dimension that ultimately does work, and with its more organic style that does contribute to a warm, homegrown feeling, Seaway come out with a likable final product on the other side. And maybe it’s the dearth of truly great pop-punk albums to come out this year, but there’s something about Vacation that clicks with a surprisingly deep resonance. There’s weight and consequence beneath its surface, and it’s something that Seaway tackle incredibly well. Couple that with the fact that this is the album that sees its creators fully defy the odds and freeing themselves of a formerly nailed-on second fiddle status, and Vacation is a much more satisfying listen than virtually anyone would’ve previously given them credit for. A lesser album in this vein may be considered the equivalent of comfort food, a quick, easy listen with an equally quick payoff; Vacation may just stick for a fair bit longer than that.